Our new Jefferson Dress is quite the eye-catching head-turner thanks to a flattering A-line silhouette (that’s especially great for hourglass shapes) and super luxe fabric--Japanese stretch twill up top and flowy Italian plaid chiffon down low to be exact. Go ahead, let them stare. Made in NYC. A-line silhouette with a length that hits just above the knee. Waist seam hits high on the waist. Our model Damaris is 5’10.5” and wearing a size 4. 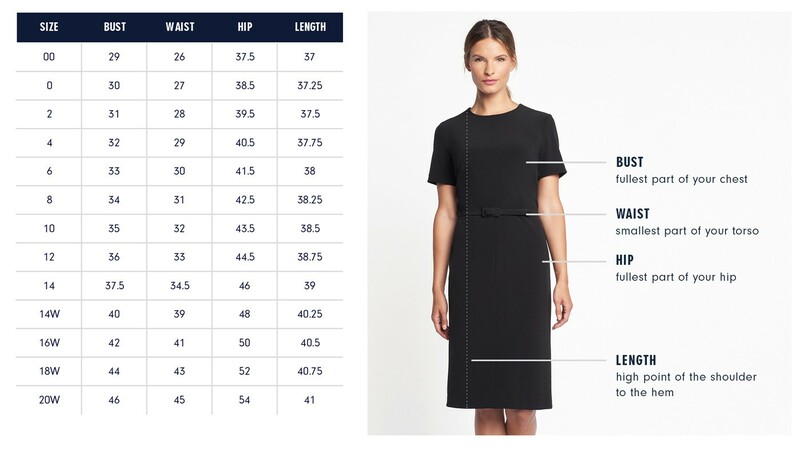 Below are the exact measurements of the Jefferson Dress. All measurements are in inches. For general brand fit, sizing, and measurements, please visit our Brand Fit & Size Guide. A-line silhouette with a length that hits just above the knee. Waist seam hits high on the waist. I love the plaid chiffon of this skirt. It perfectly blends masculine and feminine elements and the red lines add a subtle pop of color. Features: Topstitch detail on princess seams. Lined, Italian chiffon skirt.